Drew Delaware wingtip oxfords are classically handsome with modern comfort and stability. The suede uppers have distinctive accents, while Opanka construction means these shoes are durable yet flexible. 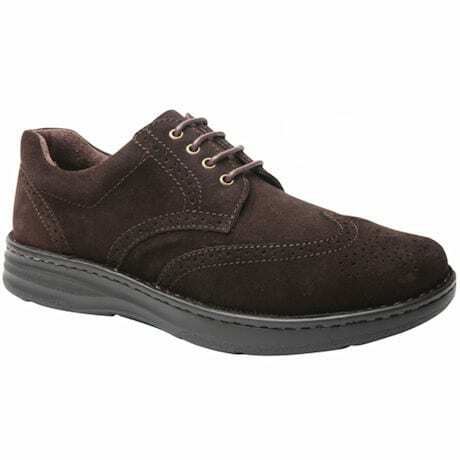 Drilex® and leather linings help keep feet dry, comfortable, and healthy, and the soft foam-padded tongue and collar reduce irritation from rubbing and squeezing. 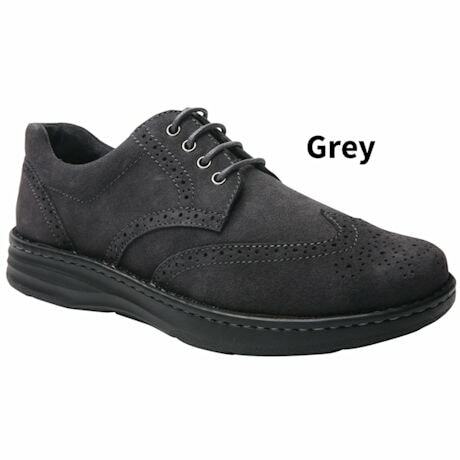 A tempered steel shank and firm heel counter provide stability and a rocker bottom encourages proper forward movement. This can reduce falls while helping to lessen muscle soreness and fatigue, so you can stay on your feet longer. The double depth shoe has two removable footbeds, so you can customize fit and use your own orthotics. Lightweight polyurethane outsole. Available in hard-to-find narrow and extra-wide widths.